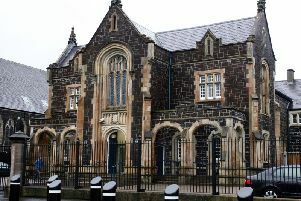 A 35-year old south Belfast woman who fractured three of her baby son’s ribs was sentenced to a total of 15 months on Thursday. The woman, who cannot be named for legal reason, admitted causing grievous bodily harm to her four-week old baby in August 2014. The boy has since been taken into care. Judge Gordon Kerr QC told the woman in deciding her appropriate sentence he must have regard to the aggravating feature in the case, the age of her young child who was very vulnerable. He added that the woman had breached her trust as a mother and the force needed to cause the injures was considerable. However, said the judge, the youngster had since been taken into case, and as such had lost the chance of a normal upbringing. His mother had also pleaded guilty and accepted her responsibility and while considered a high risk of re-offending , it was highly specific finding in her case and she did not pose a danger to the public in general. In addition if she had any further children it was likely they too would not be left in her control. The woman will serve seven and a half months in custody, followed by seven and a half months on supervised licensed parole. At a previous court hearing, prosecutor Simon Jenkins said police were called to the woman’s house by Social Services on August 7, 2014 after she had alerted the authorities to marks on her son’s body. She said she was concerned she may have caused the marks and injured her son by the way she was holding him whilst he was crying the day before. The tot was brought to hospital where he was examined by a consultant paediatrician. The baby displayed extensive bruising to his abdomen, and when an X-Ray was done, it showed three separate rib fractures. Belfast Crown Court was told the injuries were “non-accidental”, Mr Jenkins said the “level of force required to fracture the ribs of a four-week old baby is considerable”. When the child’s mother was interviewed by police, she said her son had been crying and she was trying to comfort him. She also told police she waited until the following day to alert the authorities about her son’s injuries she knew her baby would be taken from her and she couldn’t face the prospect of losing him. Defence barrister Arthur Harvey QC said that whilst his client never denied she was responsible for causing her son’s injuries, she never intended it to happen and she certainly didn’t mean to inflict harm on her son whilst trying to comfort him. Revealing the injuries were sustained whilst the baby was crying, Mr Harvey branded the incident as a “one-off” and said that prior to this, the mother and son had enjoyed a “strong” relationship.